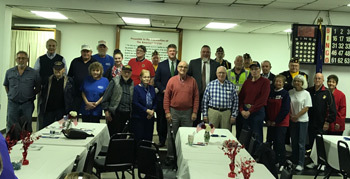 Last Thursday, I recognized about two dozen veterans from the 48th Legislative District at my Veterans Breakfast. As part of the event, I presented each veteran with a challenge coin to honor my Army service. The keynote speech was delivered by Brian Natali, chief of the Division of Veterans Services and Programs at the Pennsylvania Department of Military and Veterans Affairs. Thank you to all our veterans who have protected our country’s freedom. Additionally, I host a service officer from the American Legion at my district office in Washington on the first Tuesday of each month. The officer can help with compensation, pension, death benefits, education and health care, as well as any issues pertaining to veterans benefits or the U.S. Veterans Administration. To schedule an appointment, please call my office at 724-223-4541.